In my three years with Henry, I've witnessed more dogs behaving badly than I'd care to remember. There was the man who insisted on constantly bringing his 160-pound, unneutered mastiff into the dog run even though the huge dog would inevitably tear into the neck of a smaller dog who had committed some minor doggie faux pas. Then there was the harrowing experience of watching a large leashed mix of some sort take the entire head of a tiny puppy into its mouth and refuse to unlock its jaws no matter how much the owners screamed and pulled. (The puppy died two days and thousands of dollars in medical care later). And, just before writing this column, a dog at the local basketball court/unofficial dog run caught Henry looking at his ball and responded by viciously attacking him. What causes this behavior? And how can it be prevented? 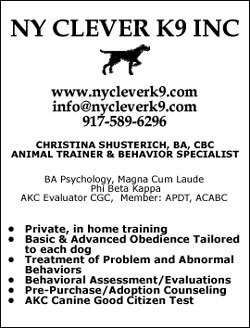 "If you watch dogs interacting with each other, aggression is a component of their social behavior," explains Dr. Pamela Reid, Ph.D, who serves as director of the ASPCA Animal Behavior Center, Manhattan. "They don't have to hurt each other necessarily, but they certainly can do a lot of threatening. But then there are some aggressive behaviors that are considered less normal in their expression." 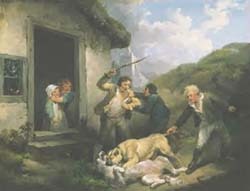 This antique painting by George Moreland (1763-1804) demonstrated how not to deal with doggie drama. Dr. Reid said many dogs particularly city dogs, can become aggressive toward each other when they're on the leash, barking, growling and lunging towards passing canines. This may be due to the dog feeling trapped and defenseless on the leash, although another school of thought holds that the dog feels more empowered being right next to its owner and behaves dominantly for that reason. There are two things city dog owners can do to address this problem. "The first is that they never be allowed to "meet" other dogs on the street. If they learn that they don't have to go through any kind of display to scare the other dog off because they learn that the other dog is not it's not a threat anyway. After mastering the 'do not meet' rule, add on another. Every time your dog passes another without meeting him or her, give your dog a treat or praise. "Most dogs will soon learn, "Hey, when I see another dog, I ought to look at my owner because they're gonna give me something good," Dr. Reid says. "And that works with a tremendous amount of dogs." But what about the dog that attacked Henry for looking at his ball, I asked Dr. Reid. Neither one of them were on a leash! "I expect dogs to be wonderfully comfortable having people near their food or their chewies or other toys," Dr. Reid explained. "But other dogs? It's not really normal for dogs to share their stuff. Most dogs are supposed to keep what they have from other dogs. Possession is 9/10ths of the law, even according to dogs. The best thing an owner can do is try not to put their dog in that situation. If you have a dog that's possessive with his stuff, over stuff, you don't bring his stuff to the dog run." But what about the woman who screams at my unleashed Henry when he runs up to her leashed aggressive dog in Central Park after 9:00 PM? What's her problem? Dogs are allowed off-leash after 9:00 PM, aren't they? Henry and I aren't doing anything wrong! "Unless you have good recall on your dog," Dr. Reid told me, "it shouldn't be off the leash." Well, then, how could this woman potentially keep unwanted, unleashed dogs away from her dog without screaming at them? Dr. Reid offers an ingenious solution. "I've found that if you yell, 'My dog has kennel cough!' people can call their dogs back to them. It's when you yell, 'My dog isn't friendly!' that suddenly people can't call their dogs and don't know what to do."